queen of the castle recipes: Happy Salad Month! Hmmm, now why isn't Happy Salad Month labeled on my calendar? LOL! That does look mouthwatering though!! :) I love love love a good salad! The heat is really cranking up here. Just today I sent my husband a salad to work because it is just too hot for a meal. He told me just an hour ago when he called that he wants me to start fixing him more salads. I'll be looking for more ideas, so share any you have. 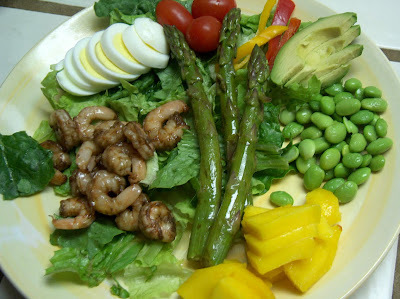 That looks awesome; asparagus and avacados are two of my favorite vegetables! I never thought of putting asparagus in a salad. Yum! I have just one word, even though it is Wordless Wednesday-YUM! What a presentation! I have to admit to being more of the just dump it on the plate variety of cook myself, though. That salad looks yummy. I love salads - I didn't know it was salad month. That looks too pretty to eat. No seriously - I'll pass. I have a salad every weekday for the health benefits - and I try not to ruin said health benefits by drowning it in yummy creamy dressing. I'm one of those who had to have everything dipped in ketchup to trick me into eating what was good for me when I was little. So I don't appreciate the taste of veggies. But they sure do look pretty!